1 Although the guitarrón is apparently not historically derivative from the guitar. See the Wikipedia article. 2 This is indeed coincidental; other members of the viol family (violin, viola, and cello) are tuned in fifths. Guitarrón (photo: Marco Antonio Torres). Historically, bass guitars are themselves a hybrid development. Before the days of amplification, the instrument of choice was the bass viol, although Mexican mariachi bands had long been using what is essentially a bass guitar1 called a guitarrón (six strings, fretless, tuned a fifth lower than a standard guitar). But the idea of an electric bass instrument flowed fairly naturally from the invention of the electric guitar, and the first such instrument was on the market (developed by Paul Tutmarc) within the same five year period that saw its first six-string cousins. Like the bass viol (unlike the guitarrón) it had four strings, tuned in fourths (which coincidentally happens to be like the bottom four strings of the guitar2). But like the guitar it had frets and was intended to be played like a guitar (lap or strap). Needless to say, it caught on. Since, unlike with the (standard) guitar, the first bass guitars were electric, I will deal with them first. The pickup story is not hugely different, so I will not re-tread that path. Current variations in electric basses are also similar to guitar, but with some variation. Fender makes bases with a 34" scale. Many other manufactures have followed them down this path. Gibson standardized on a 30" scale. Some others exist, especially the half-way 32" scale, which I first heard of on the custom bass made for Jack Casady (Jefferson Airplane/Hot Tuna) by Alembic in the 1970s. 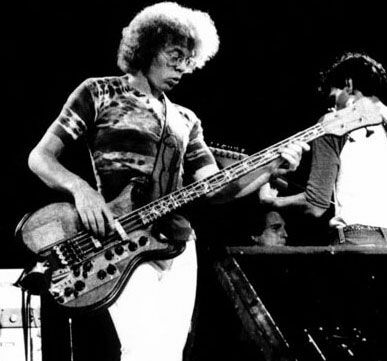 Jack Casady playing his Alembic bass. So which is better? OK, you should know by now that I am not going to tell you ☺. Since they are tuned the same, the longer scale generally gives you a little more brightness (you can always get rid of it with the tone control). In contrast, that makes the shorter scale somewhat more growly. The scale difference also means that you can get away with a slightly lighter gauge string on the longer neck basses. However, depending on the size of your hand, the short scale is a little easier to play in the range that most bass-players spend most of their time. My first professional quality bass was a Fender (Precision), but it did not take me very long to trade to the shorter scale. Now days I am back on the long scale. Go figure. What you need to do, unless you are already a bass player and you know what you like, is go the store and try on different scales for feel (you may not find the 32"). Don't even plug them in at this point, just look for how they feel to play. Then you start plugging them in and seeing which ones sound good to you (try more than one in each scale). In the same 'feel' category is neck width. The Fender Precision bass has a wider neck at the nut and widens slightly approaching the bridge. The Gibsons are narrower all the way down (I think that is why I liked the Gibsons better in my 20s). The Fender Jazz bass tries to live in both worlds-narrow at the nut, wider by the time you get to the bridge (but still with the 34" scale). Other makes each do their own thing; only you will know what you like, and you may not find out until your second or fifth bass. As with guitars, some models have built in pre-amps. If you don't want that sound right now, or if your battery dies, some higher-end basses may allow you to by-pass the preamp. As I mentioned earlier, also in the high-end range, some come with piezo pickups along with the magnetic ones to give you a wider frequency response when you want it. What I said in the electric guitar portion about how necks are attached applies here as well. Finally, how many strings you get is something you need to ask. If you are a beginner, I would probably recommend a four-string bass, which continues to be the standard. If you have been playing for a while, you should consider whether you want more. The extra string you get when you go to five definitely gives you some useful low end. You should at least give it a try. The loss, of course is that your neck gets wider. If you have been playing a wide-neck bass already (like a P-bass), this will probably mean that your strings get closer together than you have been used to as well. You will have to see if you are comfortable with that. Many quality players find that they are simply more comfortable with four, and stay there&mdasy;or go back. Six string basses are also available. I own one, but I don't necessarily recommend them (I was enticed by the fact that the extra string only cost $20 more). They definitely make your neck wider, and unlike with the five string, the strings you use more often just got farther away. If you play bass solos frequently, though, the extra high string can come in handy.  Play one and see if you like it. If you play out, borrow one and see if you like it in a real world situation. If you are really a guitarist who happens to be playing bass, you can tune a six-string just like a guitar an octave and a fourth lower (some people just do an octave lower, but you loose the advantage of the low B string). 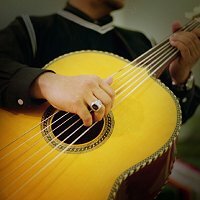 If you are already a bass player, you will probably just tune the high string to a C.
The guitarrón was actually the inspiration for the first commercially available acoustic bass, made by Ernie Ball in the 1960s. They generally have a weaker sound, but will work for playing around the living room, and for practicing. Most (not all) also sport some sort of plugability, using pickups of one variety or another, so they are still useful for stage work. What I said about scale and neck width apply here as well, but I think I would recommend against the shorter scales in acoustic basses. Without the amplification, you are going to need those longer strings. Five and six string offerings are also available. 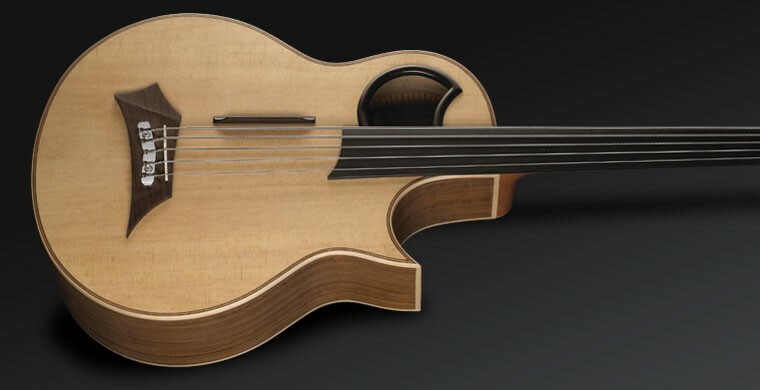 A little before the turn of the millennium, Taylor put out an innovative acoustic bass called the AB series which completely dropped my jaw. They were loud and had decent tone quality. At least part of this was doubtless because of the design which allowed the full lower bout to sound, unlike the standard centered sound-hole design you usually see. The image at right is from an e-bay listing. This is because they are not made any more. They were plenty expensive, and I suspect that the market simply couldn't bear the price, when you could easily pick up a perfectly good one that sounded like a cardboard box for a tenth of the price. Warwick Alien 5-String Acoustic Bass (fretless). Tacoma used to make a similar design, called the 'Thunderchief.' It fell a little short of the Taylor, but blew everyone else out of the water (in my extremely humble opinion). When the company got swallowed up by Fender, they sold off the stock and shut the series down. You might be able to find some of these (or the Taylors) second hand, but I think Warwick sill makes one (picture) that even sounds good in a five string! Nevertheless, there are a ton of ordinary acoustic basses out there, so unless you are really looking for the high end, there should be plenty of options, such as this quite reasonably priced Ibanez. You knew this was coming. From what I have been saying about acoustic basses, I would probably consider most of them hybrids anyway. However, no doubt there are some that are more so than others. Some, like this one, will probably give you a better plugged in bass punch, and a little less living-room, but you keep some of the acoustic sound, even plugged in.